French & Co, New York, in 1950. Geweven Boeket, exhibition catalogue, Rijksmuseum, Amsterdam, 1971, cat. 57, pp. 31 and 85. 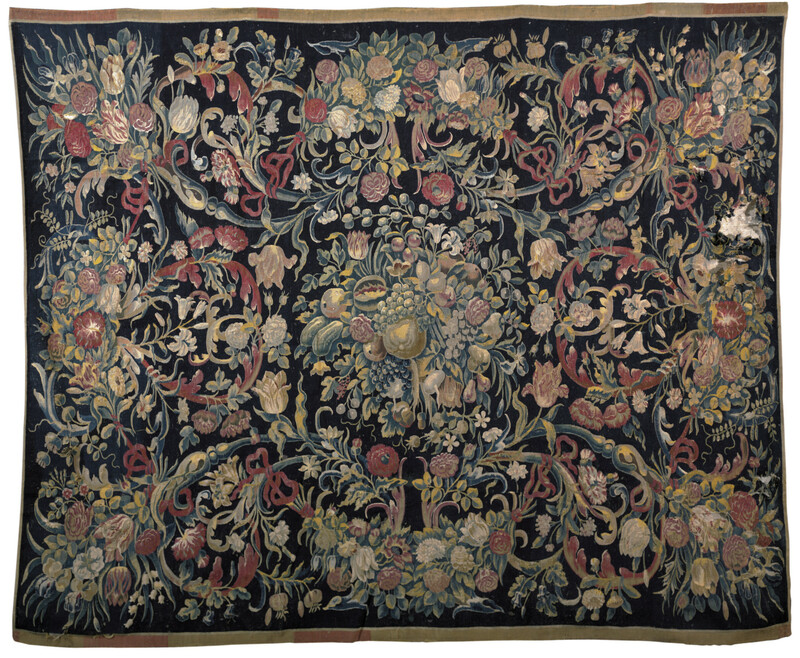 Floral table tapestries became fashionable in northern Netherlands in the second and third quarter 17th century and were mainly woven in Delft, Gouda and Schoonhoven. Based on the higher frequency of such works of art in paintings by Delft masters, it is believed that this city was the main center for their weaving. However, it is believed that only slightly over 40 such tapestries survive today, most of which are in the Netherlands and many that were illustrated in Geweven Boeket, exhibition catalogue, Rijksmuseum, Amsterdam, 1971. None of these tapestries can be attributed to specific weavers and indeed only two bear an unidentified cypher, while four are dated between 1618 and 1691.